Last night I finally managed to finish making release notes and/or journal entries on all the books I released in Dunedin. It’s taken me a while, but given that I wild released 79 books on the trip, plus controlled released (i.e. gave directly to another bookcrosser) about another 30, and most of them had photos to be uploaded with them, and I haven’t had a lot of time this week anyway, what with work, and study (my Spanish course started again on Monday, and already I feel like I’m struggling to keep up), and going out to see a movie on Tuesday night with Mrs Gwilk and the other Chick Flicks women (Memoirs of a Geisha – very beautiful film, stunning cinematography), and somewhere in amongst all that trying to catch up on some of the sleep I didn’t get over the weekend, I don’t think I did *too* badly! I think I’ve got enough reading material there to last me quite a while! The convention is getting excitingly close now. 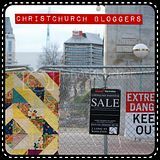 Bookcrossers are arriving in the country in droves (well, small droves), and everywhere there are signs that Bookcrossing is about to hit Dunedin in a big way. The ODT had a teaser today for a big spread on How to Bookcross that they’re running tomorrow, and I spotted the fact that Skyring had arrived in Dunedin by the fact he caught two of the books I labelled in the backpackers: The Colour of Fear and A Many-Splendoured Thing. There’s excitement in the forums, too, where rarsberry has opened the official convention thread and convention catches thread. All Bookcrossing eyes are focussed on Dunedin. Sherlockfan arrived in Christchurch today (she’s staying with lytteltonwitch tonight, and travelling down to Dunedin with us tomorrow), so we had a meetup tonight to welcome her to the South Island (and just because we didn’t have our regular second Tuesday of the month meetup this week, due to Valentine’s Day being not a great day to try and get a group booking in a restaurant). We had a great meetup – Alithia and natecull were there too, and we were a much livelier bunch than we have been at the last few meetups – probably because we were all getting a bit excited about tomorrow. Most of my books are packed ready to be taken to Dunedin (or released along the way), but I did take a couple along tonight: Green Hand by Lillian Beckwith (which I knew lytteltonwitch was looking for), and The Future Trap by Catherine Jinks (which I thought meerkitten might like, but she and awhina weren’t there (we got a text message from awhina to say they were busy packing), so natecull took it instead). I picked up Vast by Linda Nagata, and took The Black Corridor by Michael Moorcock and Sun’s End by Richard Lupoff (a book that’s been through my hands before) to release for natecull in Dunedin. As I write this, wombles’s plane is probably landing just up the road at the airport, so she should be turning up on our doorstep in half an hour or so – yet another member of the Bookcrossing Convoy that will be travelling to Dunedin tomorrow (two cars driven by lytteltonwitch and Alithia and carrying me, Sherlockfan and wombles, are leaving early in the morning and picking up otakuu from Waimate on the way past, then later in the day the convoy continues (who said a convoy can’t be spread out?) with Cathytay and daveytay, and finally after school finishes in the afternoon awhina and meerkitten will follow us). The convention is nearly upon us! is true for all values of n.
n=0 and n=1 are trivial, of course. Proof by induction involves showing that an inital case is true (in this case n=2), and then saying if we assume that the equation is true for n, does it follow that it’s true for n+1. If so, then, as we know it’s true for n=2, then it must be true for n+1=3, and that means if it’s true for n=3, it must be true for n+1=4, and so on. i.e. if it’s true for n, then it’s true for n+1, so if it’s true for n=2, then it’s true for all n.
I’ve only put in the minimum of working for the matrices – probably you should expand that a bit, depending on what your instructor normally expects. Of course, I may have totally misinterpreted the question, but at least I had fun stretching my brain this morning trying to dredge matrices and proof by induction out of the depths where they’ve been hiding all these years. Well, I got my picture in the newspaper, anyway. We had a protest yesterday about the redundancies in the College of Arts, and I somehow ended up in the photo that got in the paper (I was trying my best to hide whenever I saw the photographer, but he was popping up all over the place). When we got up this morning and looked across the street, we saw another crashed car, sitting in the remains of a tree! I’d been woken up several times in the night by squealing brakes, but squealing brakes aren’t an unusual sound in our street (there’s a few boy racer types who live in the area, and seem to enjoy driving around at high speeds in the middle of the night, making a point of squealing their way around corners), so I just thought I was suffering from natural paranoia at every loud noise I heard outside. But it seems that some of the bumps and crashes I’d heard in my sleep were more than my imagination – according to one of the other neighbours, who stopped to share the gossip (it’s funny -we’ve talked to our neighbours more in the last few days than in all the time we’ve lived here – all these accidents seem to be doing a better job of turning our suburb into a community than any number of city council sponsored ‘community days’! ), a couple of teenagers, drunk and driving without a license, in an uninsured vehicle, had crashed during the night, not once, but twice! The first time they had missed the turn and driven up into the garden of the house of the corner, knocking over some large bushes. They’d managed to reverse out (leaving destruction in their wake), and carried on hooning round the streets, only to miss the corner again not long afterwards, this time ending up wrapping their car around a more substantial tree. Amazingly (though I’m tempted this time to say “unfortunately”), yet again nobody was hurt. We’ve lived in this house nearly six years, and in all that time although we’ve seen and heard a lot of near misses there’s only been three major accidents on that intersection – two of them in the space of one day! I’m still stunned by the fact that nobody was hurt in the crash, especially when you think that it was just after 8 am, so the middle of the school rush, just at the time when the street (and the alleyway!) is normally full of kids walking and biking to school. It was sheer luck that none of them got in the way. And that’s what happens when a car plows through three gardens, bouncing off the side of our house in the process! I suppose I’d better elaborate a bit. I got to work this morning, and as I walked in the door got a phonecall from MrPloppy, “You’d better come home, there’s been a bit of an accident.” Only a few minutes after I’d caught the bus, a car had come out of the intersection opposite our house, hit another car, gone through the neighbour’s front fence (just missing their car which was parked out on the street), then through the side fence into our garden, sideswiped the front of our house, carried on through the fence on the other side (the one Dad did all those repairs to at Waitangi weekend – that was a waste of time! ), across the alleyway, and through the other neighbour’s fence before coming to rest in their driveway. The car must have been going at a fair speed, because it went through a total of four fences (including knocking out at least two concrete posts) as well as hitting our house. As soon as I got off the phone with MrPloppy I found someone to give me a lift home, and by the time I got here the place was swarming with police and firemen (and nosy neighbours!). It looks a terrible mess out there (the car ripped through quite a swathe of our and the neighbour’s gardens, too, so there’s bits of fence and bushes everywhere), but amazingly, neither driver was hurt, and our house didn’t come off too badly either – there’s a lot of damage to the brickwork, but from what we can tell there’s no real structural damage (the insurance assessor’s coming tomorrow morning to check it out, so we’ll know better then). The cats were not impressed by all the excitement, needless to say. In fact, they disappeared for most of the day (until hunger got the better of them, of course). I don’t blame them – I wasn’t all that impressed either! I had a very constructive day yesterday. After finishing as much of my patchwork project as I was able to, I took advantage of the fact that the sewing machine was out to patch a couple of favourite pairs of jeans. One pair had just a small hole, so I was able to patch it almost invisibly with a patch on the inside, but the other pair had a large tear that I wasn’t able to hide. So I decided to go to the other extreme, and cut up a few old pairs that were of different coloured denim (and were totally beyond repair so had migrated to the rag bag), and in addition to sewing one patch over the rip, I added multi-coloured patches all over the place. So I’ve now got a very colourful pair of jeans that will hopefully be servicable for another year or two. Then once that job was done I packed my books for Dunedin. All I can say is I’m glad there’s two cars travelling down together, because I don’t think all my books will fit in one car… Actually, it’s not that bad – I packed 100 books (!!! ), but most of them are thin ones, so I’ve only filled my Bookcrossing tote bag plus two supermarket bags (and one of those bags is books I want to release on the way down). Now I just need to squeeze a change of clothes and my toothbrush in somewhere, and I’m all set! And in the evening I actually got some study done! I’ve suddenly realised that I’ve only got a week left until my Spanish course starts again, and last year’s tutor warned us that the second year course throws you straight in at the deep end, so she reccommended that we do some study before term started again. Of course, I have been keeping up a bit with my Spanish over the summer, watching DVDs with Spanish soundtracks and attempting to read a book of short stories (I’m still struggling through it – only three more stories to go! ), but I haven’t really done any grammar or anything. And although I’ve technically got a week to go, in reality it’s only a few evenings – I’ll be much too busy at work this week to sneak in any study time, I’ll probably be working late on Wednesday night, there’s a Bookcrossing meetup on Thursday night, and of course the NZBC Convention at the weekend. In fact, why am I writing this – I should be studying! Oh well, I got a good start on it last night, and was pleased to see that it all came back to me pretty quickly, so a couple more evening’s work should be enough to get me back up to speed for next Monday. Its body was only about 5 mm long, so it’s pretty tiny. There was an exciting parcel waiting for me when I got home tonight: a copy of Milk Treading by Nick Smith which DianaCoats had sent me as a RABK, plus three little furry mice toys for the cats (which the accompanying note said her cat had insisted she send :-)). Surprisingly, Ming, who normally ignores toys, has totally taken to them and was last seen batting them behind the sofa with a mad look in his eyes. Progress report on the patchwork, which I spent today working on instead of all the other things I could/should be doing. The point of no return – starting to sew the first seam (actually, the point of no return was really when I ironed the patches onto the backing stuff, but somehow starting sewing seems more final). The first couple of seams are sewn, and already you can see how much smaller the finished quilt is going to end up – those little seam allowances really eat into the squares! Halfway through the horizontal seams, and it’s shrinking fast! Finished sewing the horizontal seams. The seams have all been pressed flat, ready to sew the vertical seams. Well, as finished as I’m going to be for a while, anyway. There’s still quite a bit to do, but as I said above, I need to go shopping first. But I’m quite impressed with how it’s looking so far – this watercolour quilting system is a whole lot easier (and quicker!) than traditional patchwork. I think though that if I was going to do any more, I wouldn’t get a kit, I’d just buy some fabric scraps and cut out my own squares. For one thing, it’d be a lot cheaper, and for another, I could position the squares better on the fabric. The squares in the kit had all sorts of lovely little features (like butterflies sitting on flowers) that ended up sewn inside seams because they were too close to the edge of the fabric. If you were cutting out your own you could make sure things like that ended up right in the middle where you could see them – it would waste a lot more fabric, of course, but it would end up looking nicer. And another nice surprise, I got a catch this afternoon on a book that I released in August 2004. It’s still in Lumsden where I released it, but it sounds like it might have passed through a few hands in the intervening years. And I released a book today too. I’m trying to get back in the habit of carrying a ready to be released book with me whereever I go, so that I can do spontaneous releases. So when I went up to the supermarket this morning to get some bits and pieces, I released The Enemy You Killed by Peter McFarlane on a bench outside. I’ve released a few books on that bench in the past, and not had a great catch rate, but it’s always worth another try.